Let's try investigating who might be the primary suspect in the page turning life and death mystery whodunit set in Gan Eden. Many commentators have debated what might have been the real identity of the proverbial apple fed by Eve to Adam. Some say that the troublesome fruit was grapes and so the excuse for not following orders was that they were DUI. Others claim it was a fig, note the beginnings of the rag trade and multi-billion $ fashion industry was fig leaves. Still others say it must have been wheat because a baby can’t speak intelligently and say abba, eema until they’ve tasted wheat so that must be the “tree” of knowledge. We all know that the best way to a man’s heart is through his stomach. Like my mother of blessed memory used to council me – don’t ask for anything from your father when he first comes home from work, wait till he sits down and has a nice dinner before you hit him up. That’s what I call Chochmat Nashim – women’s wisdom. Whether it is wheat, barley, spelt, rye & oats one of these 5 grains must be the major component of the substance we call bread upon which we can recite the Hamotzei Lechem Min Haaretz blessing. 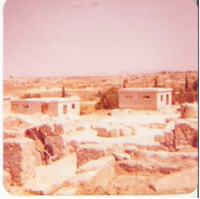 At classes with Rabbi Yitzchak Ginsburgh at Kever Rachel in Beit Lechem – The House of Bread, we learned that the women have kept the tradition of what those obscure grains might actually be today and we can trust our ladies to remember correctly. The grains must be pulverized into flour to resemble the dust of the earth which Hashem used to mix with the dew that rose up from the garden floor and kneaded into the hunk of dough called man. So there’s your second major component – water. If the dough is made with juice it’s not called “bread” and gets the mezonot bracha. Brit Melach – a covenant of salt is what our relationship with God is called. All life starts in the waters of the amniotic fluid slightly saltier than the sea. Something perpetual that preserves – it keeps the Dead Sea Dead and keeps meat and pickles edible and adds flavor and helps the leavening process. These are great metaphors for the process of getting nourished from our ancient heritage without getting moldy. “Tov shem m’shemen tov,” (Kohelet 7:1), better a good name than the most extra virgin olive oil. We discovered an ancient Byzantian oil press in our front yard back in 1976 when we first moved to the moshav. We helped the Antiquities Department dig up the dig whose artifacts were carted off to the Rockefeller museum in East Jerusalem. 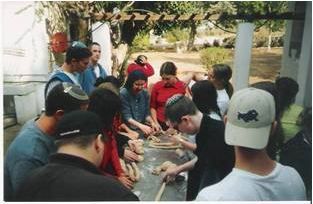 Life on the moshav was very challenging in the early days of sporadic water supplies no phones and quiet isolation. Paradoxically the more you crush an olive the more lovely oil it can produce. Isn’t that the diametric opposite of western striving for the “good life” = easy life? The oil of affliction softens our thick skin, making us sensitive to others suffering, lights up the darkest night of Chanukah and lightens our challah. The egg is a symbol of the cycles of life and death the first food served to a mourner after a funeral and the last food eaten before the fast of Tisha B’av, round and round we go. We make round challah with sweet raisins for a sweet New Year. Hamtakat Hadinim, sweetening the judgment by adding a little brown sugar & honey to the yeast mixture otherwise the yeastie beasties can’t grow and bubble and do their job of lifting and uplifting. Simcha is like the sweetness of spirit that makes us rise up out of our sluggish laziness. Rise up, get going! Put on some Jewish music with a nice steady rhythm, Reb Shlomo’s Mizmor Shir Le'Yom Hashabbos is a great one for kneading the challah. Mix 1½ cups warm water with 2 teaspoons yeast and ¼ cup brown sugar and watch it bubble up. Add one egg, three tablespoons of oil and approximately 5 cups of flour, best a mixture of white and whole wheat add 2 teaspoons of salt and knead into soft elastic dough. We need to stay open and stretch ourselves to share our bounty with our many guests every week. To say the bracha on separating the “challah” we must have a total of 2.2 kilo or 5 pounds of flour which we get if we make 3 batches of dough. It’s a moment of favor when the gates of heaven are open when women fix the mistake of Adam and Eve. They should have waited for Shabbos when they would have been able to eat from both the tree of knowledge of good and evil and the tree of life. By separating the little piece of challah we deny ourselves a tiny bit of pleasure now in exchange for infinite pleasure. Make sure your tears mix into the dough as you pour out your heart and ask for everything you want or need for yourself and friends; healing for a loved one, a soul mate, parnassa, whatever comes to mind and heart, just let it flow. Let the dough rise till double then sculpt into your favorite shapes, let rise again, brush with a little beaten egg. Sprinkle on some seeds, those nutrient packed little germs of life encoded with DNA = Alef Bet codes to remind us of life giving manna in the desert and bake at 350° around ½ hour till golden brown and smells yummy. Listen carefully, it should sound hollow when tapped. We use all our senses to gain an intuition of when the time is right to enjoy our fruits. This Sunday night and Monday, August 14-15, is Tu B’Av, a day described by the Sages as one of the most joyful of the year. There are many historical reasons for this but there is no doubt that its prominence is connected to it being just a few days after Tisha B’Av, the “lowest” point of the Jewish calendar. Traditionally this was a day of rejoicing and the opportunity for men and women to come together in an atmosphere of holiness and joy, which then awakened a desire to find one’s soul mate. The following poem is written in that spirit. May all those still looking to get married merit to meet their soul mates soon and may those already married recommit and appreciate their life partners. to find their soul mates. And I implored (va’etchanan) God at that time saying, “My God, you have begun to show Your servant Your greatness and Your strong hand, for what power is there in the heaven or on earth that can perform according to your deeds and according to your mighty acts? Let me now cross and see the good land that is on the other side of the Jordan, this good mountain and the Lebanon” (Deuteronomy 3:23). As Moses relates in the very next verse, God while not accepting his plea, did allow him to see the Promised Land from afar. The numerical value of “va’etchanan,” 515, is a remez, a hint to the 515 different prayers of supplication Moses prayed (Devarim Rabbah 11:6). Rashi adds that the word “va’etchanan” is one of ten Hebrew words for praying. Amazingly the generic Hebrew word for prayer (tefillah) also has the numerical value of 515. Yet after all his efforts Moses was not granted his greatest aspiration. We could then ask: if Moses, the greatest prophet and leader, was not granted his request after 515 prayers, what can we expect to gain from praying? The Slonimer Rebbe writes that Moses was not really praying on his own behalf; rather, he was praying on behalf of the Jewish people and the entire world. His fervent desire to enter the Land arose because he knew that if he led the people into the Land, he would be the Mashiach, the Temple would be built and never destroyed, and the final rectification of the world would occur. Despite his noble intentions, God informed Moses that the time had not yet arrived for these redemptive acts. The world was simply not ready. Despite this explanation, the question still remains, how can we expect our prayers to be granted if such an exalted individual’s were not? And if so, what is the point of praying if not to be granted what we pray for? The answer to this question is that God does listen, accept, and respond to all our prayers. However, we may not always hear or understand His answers, nor like nor accept them immediately. We should not forget that according to Jewish tradition every individual’s thoughts, words, and actions are recorded and have an effect. Nothing is ever lost and no prayer in the bigger picture is in vain. If so, we must ask, what was the effect of Moses’ prayers? By praying so intensely and deeply to enter the Promised Land, Moses imbued the Jewish people for all eternity with the passionate desire to be connected to the Land. Although he did not personally enter the Holy Land, he bequeathed to all the Jews who lived in exile the will power and desire to never give up the hope of returning to the Promised Land. History has in fact tested the tenacious faith that Moses bequeathed to his people. Even 2,000 years of exile did not extinguish the Jewish people’s burning desire to return to their homeland. And we, who have merited to either visit, live for a while, or settle in the Land of Israel in this day and age, are the living proof and answer to Moses’ prayers. The potency of his prayers was tremendous; in fact, not one of his 515 pleas was lost or in vain. We must comprehend this notion of prayer and integrate it into our own lives. This concept of prayer may also explain why the text of the Shema, Judaism’s cardinal statement of faith in the unity of God, appears near the end of Va’etchanan, and not earlier in the Torah. When everything is going our way, it is easy to believe in God and experience His Providence in every aspect of our lives. The true test of faith arrives when we feel that God is distant, that he is not answering our prayers. Perhaps, the Shema is revealed in this portion because only now does Moses himself finally completely understand this message. He had to undergo his own trial of faith to understand that even when God seems to ignore our prayers or responds in a manner not to our liking, we must still cling to the belief in God’s oneness, that God is the source of everything and that everything He does is ultimately for the good. Va’etchanan is always read on the Shabbat after the Ninth of Av, the day dedicated to mourning the Jewish people’s tragic history. Perhaps this is another reason the Shema appears in this portion. After the fasting and the mourning, we need to declare once again our enduring belief in God’s oneness. Just as the Mourner’s Kaddish (recited after the death of a loved one) exalts God’s greatness despite the mourner’s recent personal loss, the recitation of Shema on the Shabbat following the Ninth of Av reaffirms our belief in the justice of God’s decrees and signals our acceptance of His Divine Providence. It's almost Tisha B'Av, but we still have two hot summer days until then. Two hot summer days during which we can't eat meat! Well here's a solution for a tasty and cooling afternoon snack or light dinner. Blend till smooth: 3 large cucs scrubbed but not peeled with 1 large zucchini, 1 container 3% plain yogurt, 1 clove garlic ¼ C lemon juice 1T salt, a handful each of fresh dill and spearmint leaves and enough water to make the machine go. Chill till really chilled. 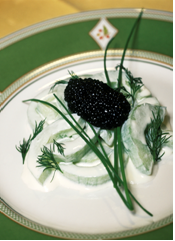 Serve with a generous dollop of sour cream and for fancy sake garnish with sculpted sliced cucumbers (they look like flowers if you scrape the tines of a fork deeply & vertically over the cuc before you slice it) and a sprig of mint or dill on top of the sour cream for contrast – it’s pretty and oh so refreshing.